What ways have worked for you to help your child harness tech's inherent values? If you are a regular reader of this blog, you may already know that I write frequently about kids and technology, most recently covering such wide ranging topics as cyber bullying and the latest kid-friendly iPhone & iPad apps. Most recently, I posted about tips to shop smartly for holiday technology gifts for kids. 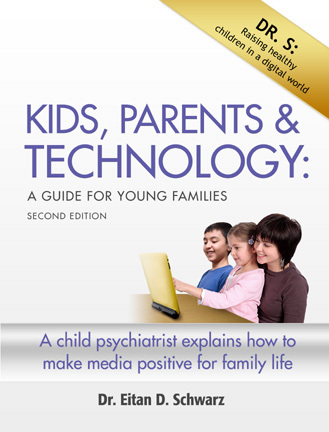 Having just read Dr. Eitan Schwarz's 2010 book myself Kids, Parents & Technology: A Guide for Young Families, I felt a strong need to comment on how invaluable I think this title is to any parent with a child growing up in today's digital age. Dr. S gets right to the point in the preface of the book. He says that we parents need help to manage our kids' usage of technology and we must take a more proactive role in encouraging our children to use it wisely. Organized into three sections: "Setup & Quick Start Guide," "User's Guide," and "Food for Thought," this book is one that I wish I had been sent home with from the hospital after the arrivals of my triplets and their big brother, all four who are now teenagers. Now, without further adieu, here is Dr. Schwarz's guest post for MommyBlogExpert.com -- I hope you learn as much (or even more) from this than I have. 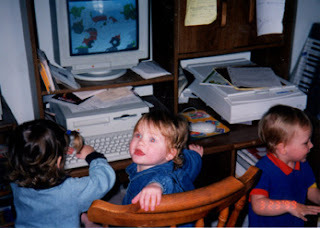 The explosive use of home computers and other technology-based consumer media -- some intended for children as young as six months old -- has parents like you concerned about the impact of computers, video games, smart phones and other interactive media on your child's development, family life, and social relationships. In actuality, the topic of how to guide children so that they use technology wisely is a subject of widespread interest with great ramifications for the future. Younger and younger children are now in charge of how they consume media, and they are mostly consuming junk. Surveys show that older kids currently spend over 50 hours a week and this is increasing. In fact, family interactions, imaginative play, and grades actually tend to drop when media usage increases. Further, excessive consumption can cause emotional difficulties, as well as result from existing ones. Certainly, children need the thoughtful, active and positive guidance of their parents in this amazing Wild-West tech environment. Merely restricting access is not enough and I recommend that parents begin when your child is an infant, gradually decreasing their supervision and participation as he or she grows older. For every age group, there is a world of fun Internet sites and electronic games that can contribute to a child's development. Take Charge - Have confidence and take command. You can manage this important area of your kids lives because you have the home-court advantage. Many parents too readily take a back seat and let kids take the lead. Think about it: in what other important areas of life would you normally let that happen? Think of Media as Appliances - Start thinking of media as family appliances that must have positive values. Kids treat media as toys, but they are in fact adult tools with enormous power. Would you let your unsupervised young child use the telephone or oven? Only devices with proven benefits belong in children's hands. Remember, Technology is Healthy - From infancy onwards, teach your youngster to appreciate technology as a healthy and routine part of family life. Starting young, children will learn that using technology is collaborative and social -- not an isolating solitary activity. Include the Whole Family - Create a new environment around the online family computer and other media to promote mutuality, fun, respect, and development for the entire familial group. Moving the home computer away from the wall and arranging seating all around it will make it a popular center for family life for both kids and parents. Make Media a Positive Learning Tool - Just as you already shop for healthy food, harvest the positive opportunities offered by media. 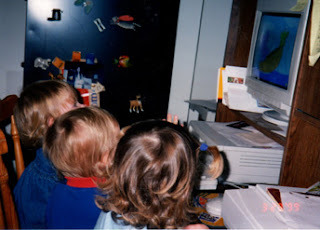 For every age group there are many wonderful Internet sites, apps, and downloadable software for the home computer that offer a world of learning entertainment experiences. Create Healthy Media Plans - Like you do meal plans, tailor media use into daily menus for each child to provide growth opportunities. One way to do this is to regularly require enough online time on activities that actually enhance good values and education enrichment. Kids, Parents & Technology: A Guide for Young Families (MyDigitalFamily.com, 228 pages, Softcover $26.95) is available on Amazon, Barnes & Noble and Lulu nationwide. Recognizing the educational power of audio and visual devices, Dr. Schwarz, who is board-certified in general and child and adolescent psychiatry, conveys his messages through a series of videos: some for parents, some for children on Mydigitalfamily.org Dr. S, as he is known to his young patients, has been a practicing psychiatrist serving families and their children for nearly 40 years. He is a graduate of Cornell and Johns Hopkins Medical School. 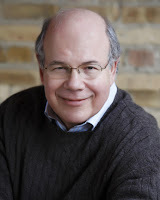 He has been head of the child and adolescent psychiatric division at Evanston Hospital and is currently on the faculty of Northwestern University in Evanston, Illinois. What ways have worked for you as a parent to help your child harness everything that the Internet, computers, and digital technology have to offer? Please leave a comment and share your ideas here. FTC Disclosure: Eitan Schwarz, MD, provided the content for this guest column. Also, I received a copy of the book to facilitate review. However, I did not receive payment or any other compensation associated with this particular post. See complete FTC Disclosure information that appears at the bottom of MommyBlogExpert's main page and at the bottom of every individual post on this blog, including this one.